Before you can paint your kitchen cabinets, you must make a few key decisions—what type of paint to use, and in what sheen and color. Read on for top tips to guide your decision making! Want to update your kitchen but don’t have the budget for a complete renovation? You’re certainly not alone. Here’s a middle ground to consider: why not give your cabinets a new look, on the cheap, with a fresh coat of paint? 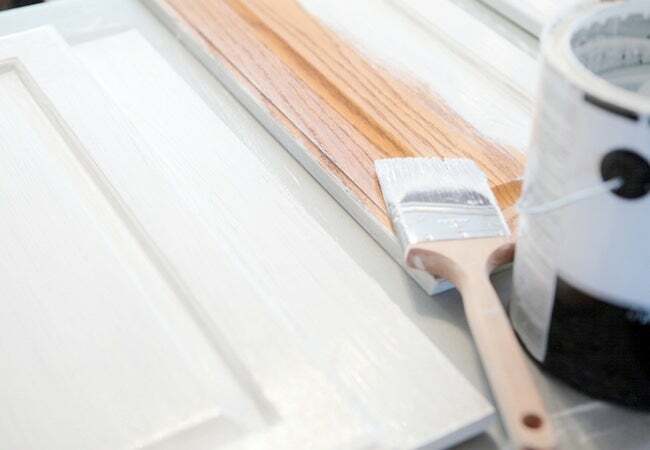 If you want a brushed texture, choose an oil-based paint. For smoother finishes, water-based latex paint makes the better choice. Only bear in mind that some oil-based paints take up to 24 hours to dry, while latex typically dries within a few hours. Once you’ve made the oil-or-latex decision, consider the question of sheen. Since the kitchen cabinets undergo a great deal of wear and tear, it’s wise to opt for a semi- or high-gloss paint. That way, your painted cabinets will be easier to clean and less prone to dulling over time. Painting the cabinet interiors, too? For that, make it a point to use paint with an eggshell sheen. Glossy finishes often show indentation marks and in some cases, may even stick to heavy dishes. Finally—color selection. Perhaps the most important decision of all. Generally speaking, homeowners succeed when choosing a cabinet color that complements the countertops, flooring, and appliances. Just note that very light and very dark shades show wear more quickly than moderate shades. Before painting, apply primer to cabinet surfaces in order to prevent discolorations or wood knots from peeking through.